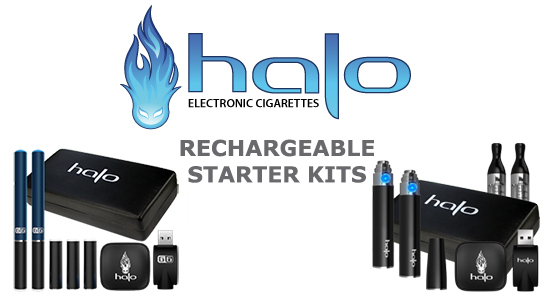 The G6 version is Halo’s standard model e-cigarette and, like many other brands, closely resembles the appearance traditional cigarettes. This is very common in the industry as e-cig makers try to give ex-smokers a familiar product. Unlike traditional cigarettes, halo currently offers the G6 in a myriad of color that can be chosen at no extra cost. One of the features we liked best is that fact you can actually fit a Mini Triton tank onto the G6. Using a triton tank as opposed to the standard configuration gives you the option to purchase Halo’s e-liquids instead of having to rely solely on the cartomizers. In our experience the e-liquids actually lasted slightly longer than the flavour cartomizers and, given their reusability, are sure to save users some money in the long run. This also affords you many more flavour options as you can opt for one of the many e-liquids available or even create your own blend of flavours! 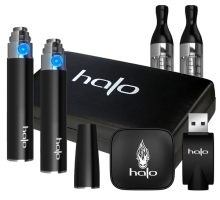 Halo has a fantastic product in the G6 but if we were to come across a vaping aficiandado we would almost certainly recommend The Triton Tank system instead. The Triton is the natural evolutionary progression from the G6. These units use Halo’s “Triton Tanks” instead of the cartomizers required by the G6 models. For the user this means better savings, as the Triton Tank seem more efficient than the atomizers and each of the working pieces can be replaced for minimal cost rather than needing a new unit if issues arise. Users will also notice more convenience, as the Triton tanks generally last longer than the atomizers mean less refills. Finally, the system is rendered more enjoyable by advanced features such as voltage control which helps dictate how strong the throat hit is. The options of flavours available are also greatly improved as you are now free to mix and match the e-liquids as you see fit (Which you can also do by retrofitting the G6 with a mini triton tank). These tanks are of the highest quality and can hold a maximum of 2.4 ml of liquid. They are designed to not drip, to be easy to clean, and are available in multiple colours to better appeal to your personal tastes. The Triton also has a couple of nice options at batteries with users basically needing to choose 2 of 4 characteristics. The starter pack includes 2 batteries and the user is given the option of either the small battery with a capacity of 400mAH or the large battery rated at 1300 mAh. These batteries, are also available in multiple colours so you can again add your own personal flair to your ecig. You are also given the option of a fixed or variable voltage battery. Variable voltage batteries are a little more pricey but are well worth the extra control you get. The variable voltage battery allows you to raise or lower the voltage produced so as to create either thicker or smoother vapor; not unlike cigarette smokers do by unconsciously pinching the filter closed. The unit includes a small dial which can adjust the voltage. More voltage equals thicker the vapour. Newly minted quitters may find this feature especially useful.